Shares of Disney are leading the Dow Jones Industrials today. Positive comments from Cowen have sparked a powerful breakout ahead of its investor day. DIS is up over 1.5% and is trading at new 2019 highs. The stock is now up 9% and has layers of support in place. A retest of the 2018 peak is looking very likely. 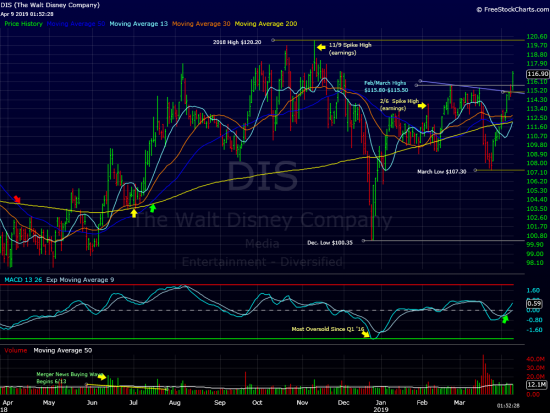 Highlights: Disney is clearing a heavy resistance zone near $115.50 today. This key area marked multi week highs in February and March as well as last week’s high. The $116.00 to $115.00 area should be considered a low risk buy zone in the near term. On the downside, a close back below $113.00 would indicate a failed rally attempt. We expect DIS to make a run into new all time high territory as today’s breakout move develops. At time of publication we do not have a position in DIS.